One of Quebec's largest and sovereigntist-leaning labour federations has dropped its long-standing endorsement of the Bloc Quebecois and some of its member unions are supporting the NDP, making party leader Tom Mulcair "extremely proud." One of Quebec's largest and sovereigntist-leaning labour federations has dropped its long-standing endorsement of the Bloc Québécois and some of its member unions are supporting the NDP, making party leader Tom Mulcair "extremely proud." Mulcair said he will "work hard to maintain the support" of unions such as the Quebec Federation of Labour, known by its French acronym FTQ, in order to "expand our traditional base and rally progressives across Quebec and Canada." 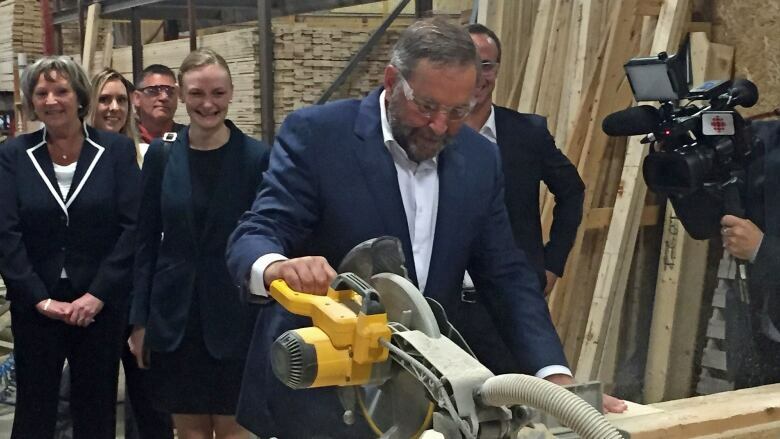 He made the comments Tuesday during a campaign stop at a pre-fabricated house company in Mascouche, Que., about 40 kilometres north of Montreal. Mulcair was reacting to a report in Montreal newspaper La Presse, but it's one that's being disputed by the FTQ. In a television interview on RDI, FTQ secretary-general Serge Cadieux denied the labour federation is endorsing the NDP, disputing the La Presse report. Cadieux said the FTQ's position is to target 10 to 15 ridings in Quebec where the Conservatives have a chance of winning, and support whichever other party has the best chance of defeating them. The union head said that could be any one of the NDP, Bloc, Liberals or Greens, and that the FTQ will make a final decision on which parties and which ridings they'll target at the union's general assembly at the end of August. La Presse reported Cadieux isn't aware of any member union supporting the Bloc. Cadieux told RDI that people are going to vote according to their convictions. "In other ridings in Quebec the Conservatives don't really have a chance, so we're going to concentrate our energies in those ridings where the Conservatives could make gains. Right now they have five MPs in Ottawa ... they might have a chance in another 10 ridings, so we'll concentrate our efforts there," he said. Mulcair brushed off suggestions that support from a large and powerful labour union that has historically supported the separatist Bloc would hurt the party's image outside Quebec. The NDP leader said the NDP is a big tent that welcomes all Quebecers, even if some of them have supported the sovereigntist cause in the past. "That's the beauty of the NDP's offer to Quebecers," he said. "We want to go beyond the old quarrels of the past." The FTQ has officially supported the Bloc Québécois in almost every federal election since the early 1990s. Quebec's FTQ federation covers 37 labour unions and counts 600,000 members.